Dancing Woof Couture & Peace-Paws.com: Susan Lanci Cuddle Cups! Winter and the holidays are here at last! We have some special goodies for you to consider. One of our favorites is this Pink Leopard & Curly Sue Cuddle Cup Bed by Susan Lanci Designs. 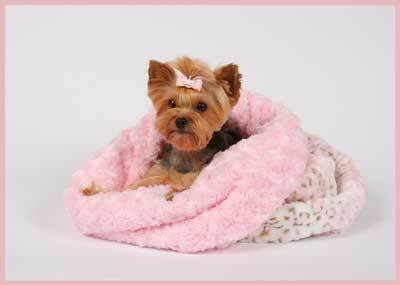 Dog Snuggle Bed is a small dog favorite for those who love burrow and snuggle. My little ones love to cuddle up in their cuddle cups. They are ultra luxurious favorites of ours. This dog bed can be used 3 ways: as sleeping bag, cup style for laps or spread it out for a doubly luxurious 50" x 20" throw! A Susan Lanci Design. Dimensions: 20" w x 25" l. Be sure to check out all the faux fur color options.